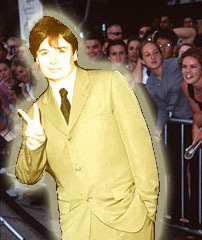 Mike Myers is a very talented fellow who got his first acting job as a child, doing a commercial. He was a nice, down-to-earth guy. He married a nice, down-to earth woman. He got acting jobs, which led to better acting jobs, which led to being a cast member on Saturday Night Live. He then left the show to do films, and was successful due to his talent. He remained nice and down-to-earth. He is still alive. Worry not, I am not going to trash Mike Myers. He seems like a nice guy. Very down-to-earth. But it is clear that some producer thought that his story wasn’t particularly exciting or inspirational, and certainly didn’t fit the A & E mold. We needed him to overcome Massive Tragedy! Setbacks! Tragic flaws! He needed to have drama happen before every commercial. And A & E KNOWS drama! …and so they provided Mikey with three catastrophes to overcome. And they played them up. Dramatic close-ups, music, freeze frames - the whole Drama treatment. They wanted us to FEEL his cataclysms along with him, so we could weep and thus somehow be closer to this Hero among townsfolk, this Giant among men. I promise you, I am not making the following up. CALAMITY ONE: He only got to perform with Gilda Radner once, when he was a small boy. Do you remember that commercial I told you about? His first acting job? He was playing opposite an adult Gilda Radner. But then he grew up, and became a member of the Not Ready for Prime Time players, and in fact became one of the all-time most loved members. But that is not good news, because by the time he was finally able to ensure himself comedic immortality and true fame and fortune, Gilda Radner was DEAD and he wasn’t able to perform with her one last time, or even chat with her. You people reading this, with your petty little problems, worries, and cares don’t know true sorrow. Think of poor Mr. Myers. Think of what this man has to go through every single day of his life, with nothing but a loving family, fame, artistic satisfaction, and amazing amounts of wealth to tide him over day to day. He only got to perform with Gilda Radner once. Don’t frown at me; I’m not going to make light of this. It is sad that his father died. Mike Myers was so broken up that he stopped working for a year to mourn, and eventually did the Austin Powers movies in part as a posthumous gift to his late father. This is sad. But I have to say, this is a sadness that is lying in wait for all of us, if we are lucky. That’s is the way it is supposed to be - the child buries the parent. If things go the way our parents want them to, we will all bury our fathers, and we pray that they are elderly when it happens. My colleague lost his mother last year. It was very sad for him, and we sympathized. I’m going to be devastated when one of my parents die. It is going to be financially very tough for me to get to the funeral on short notice, and (although it will be hard) I am going to have to take a few days off of work. And I can’t even picture what it will be like going back, about a week later, to do my job with this weight on me. I’m glad that Mike was financially able to take a full year, and that he was able to create such a wonderful tribute to his Dad. I will not be that lucky. Again, think about what A & E wants. Most of their viewers have lost a parent, or (like me, and probably you) have a close friend who has. And yet they are supposed to feel that Mike’s loss is somehow worse, somehow more real than theirs, because he took a year off of work, and he is a celebrity. How many viewers have a friend or co-worker with a terminally ill parent, and don’t really care all that much, yet are breaking out the Kleenex for the celebrity’s burden? My grandson is currently taking Calculus, and he has brought home some of your published materials. They were the perfect blend of whimsical and educational, and this old dog learned a lot from perusing them. He also put in the CD-ROM that came with the Stewart book, and I liked the way you explain things. You are very talented. P.S. I am glad you liked the Yellow Submarine movie, but unfortunately that was not me doing the voice of the cartoon. Think of how lucky it was that Harrison decided not to put off writing that letter until another day. Think of how wonderful Mike Myers should feel, knowing that the lead guitarist for the Beatles, the author of I, Me, Mine, the executive producer of Monty Python movies, received some joy in his last days from Austin Powers. Had Harrison lived, Mike would have, I’m sure, wrote him a nice letter back, perhaps enclosing a bit of memorabilia and an invitation for a cameo. But tragically, George did not. Think of the millions of Harrison fans who got NO letter. Somehow, they manage to get through their pathetic, grotty little lives. One miserable day at a time - check mailbox, no letter from George, go to work, come home, check mailbox, no letter from George, cook dinner. The A & E biography really got under my skin. I think it is because I'm positive that it worked. There are people all over the world who watched it along with me, and were inspired by how this ManGod was able to triumph over adversity, and were in awe of this superior being, Mike Myers, who somehow moved beyond his misfortunes to create Wayne’s World II. And those same people, those SAME PEOPLE, are living far less fortunate lives, and know people who have trumphed over far greater adversities. I’m sorry, Mike. Nothing personal - I gather that you are a nice guy and very down-to-earth. I would love to sit next to you on an airplane. But I think you would agree that you are lucky man. You are talented, found love, became rich and famous with comparatively few setbacks, and are now employed doing something that you seem to love doing, and doing it better than almost anybody else can. I know your success was not handed to you, that you had to work very hard. But most of the people who were watching that show work hard at their jobs, too. And they’ve overcome more tragedy, had more pain, sorrow, and drama than you have, and will never even touch your success. As I said, I don’t blame Mike for that bio - it was clearly a case of A & E trying to fit a kind, well-adjusted peg into a twisted hole. I wish that they had either picked a different subject, or risen to the challenge of making a nice guy’s life interesting.